The past few months, God has spoken to some of us that a greater fulfillment of certain portions of Ezekiel 36 could soon unfold. Ezekiel 36 speaks much of the “mountains of Israel.” In this chapter, Ezekiel is told to prophesy redemption and restoration to the mountains, which had been usurped and plundered by surrounding nations. (verses 1-12) These mountain are known today as the West Bank and Golan Heights. The downed Israeli aircraft crashed this morning on the mountains of Israel. When God breaks through with the Jewish people at new levels, demonic resistance often occurs. In this instance, the civil war in Syria is entering a new phase, with an Iran-Syria-Lebanon/Hezbollah axis emerging. As a result, an unofficial Iranian caliphate could soon extend from ancient Persia to the Mediterranean Sea. This anti-YHVH axis is supported in significant ways by Russia. Military analysts say it is set on a collision course with Israel. To prevent the current situation from escalating into regional or even global war, Israel reportedly seeks to resolve three key issues. First, armed Iranian and Shiite forces near our borders must relocate. 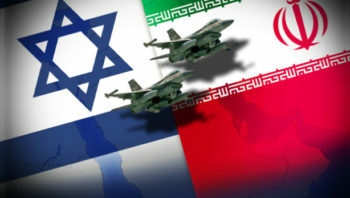 Second, Israel wants Iran to dismantle its rapidly expanding military infrastructure stationed in Syria. Third, an agreement that “whatever happens in Syria, stays in Syria,” must be enforced to prevent spillover fighting into Israel. The military analyst, however, did not take into account the mediation of Israel’s King, the Lord Yeshua, and those to whom He has delegated the ministry of mediation. (2 Corinthians 5:18-19) It is said that intercessors make history. Will you petition heaven with us for mercy in this crisis? You can access dozens of strategic prayer points and relevant Scriptures to declare here. Please pray that God’s just plans and redemptive purposes materialize in a way that causes minimal harm and destruction with maximum blessing. “The nations will know that I am Adonai – it is a declaration of Adonai – when I am sanctified in you before their eyes.” (Ezekiel 36:23, TLV).